Do you use nutrition labels? You should! And the FDA is finally making it easier to do. Nutrition labels have been notoriously difficult to interpret and most individuals report not regularly checking nutrition labels when they purchase packaged foods. 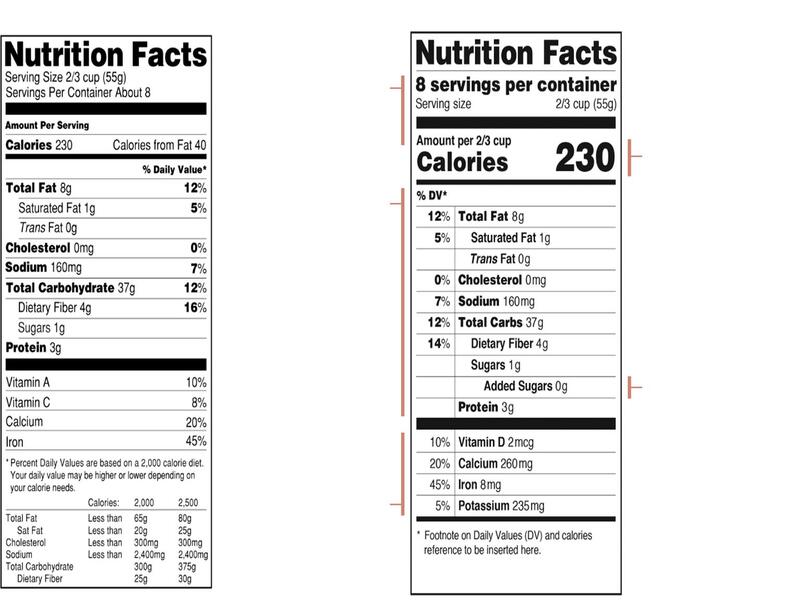 However, this is changing and nutrition labels are changing. The nation as a whole is becoming much more conscious about nutrition and what we put in our bodies. This is a large reason why rates of obesity at least appear as though they are starting to level off for adults (and even declining in very young children). With this comes the first significant change in nutrition labels in 20 years! 1. Serving sizes are going to be adjusted to reflect what people normally consume. So you’ll see nutrition info for a full 20oz bottle of soda instead of just 40% of it (note a few companies did this voluntarily already- good job) and a cup of ice cream instead of 1/2 cup. 2. Calories are being made much more prominent. Hands down the most important thing an individual can pay attention to with regard to diet is the number of calories consumed. That’s not to say that other things aren’t important but, plane and simple, calories determine our body weight. 3. ‘Added Sugars’ has been added. Therefore, manufacturers now need to report just how much (and it’s often an insane amount) of sugar they dump into your food and drinks. Hopefully this will not only help people to become aware of just how much added sugar they are ingesting (a can of soda has 8 teaspoons, while the RDA for women is only 6!! ), but also get manufacturers to start lowering the amount of added sugars. Several other minor changes have been proposed but those are the big ones. These are GREAT changes, and the FDA should be commended. But… it’s still going to be a couple years till we actually see the new labels on food products on the shelves. Click here to see Dr. Ochner talk about the new nutrition labels on ABC News Digital.